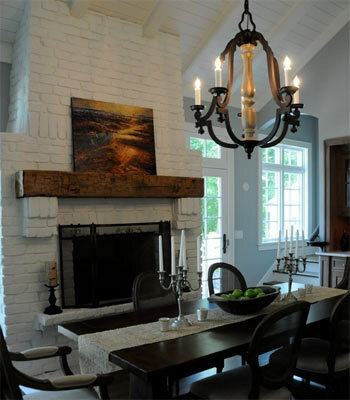 How to paint a brick or stone fireplace and all the tips and tricks that you need to transform the old brickwork of your mantle or fireplace. 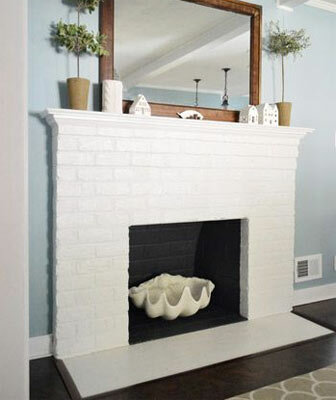 Find out how easy it is to paint and decorate a brick fireplace, what paint you should use and get some great ideas. If you’re decommissioning an old open fireplace, or if you have a brick fireplace that’s looking tired and shabby, a lick of paint is just the thing to brighten it up and could make all the difference to a room. 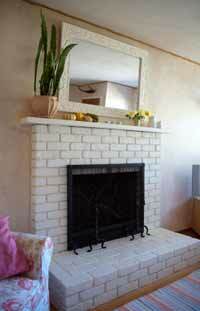 See our guide on painting a brick fireplace below for the best way to do this. If you’ve just moved into an older property, a damaged, old or ugly fireplace could be the one thing preventing a room from really taking shape. While an old-fashioned fireplace sounds great in principle, they often look sad and ugly rather than charming and quaint. You may find that some of the bricks are damaged, or that the mortar in between is crumbling and needs replacing. If there used to be an open fire but you prefer to have an electric or gas fire, or if the chimney is too damaged to make keeping an open fire viable, then painting the fireplace is a good idea. There is no reason why you should keep the dark, smelly, layer of soot! What Type of Paint to Use? You’ll need to use a good primer and sealer on the brick first to stop the soot from coming through and staining the paint. International Paints sell a 3-in-1 Primer, Sealer, Undercoat that will do the job well. Buy enough to do two coats. For the top coat a good quality eggshell is the best thing to use – you will need to go to a professional –paint store to obtain this, but it’s worth the extra legwork as it will last a lot longer and give a more protective coating. Start by moving any furniture and ornaments away from the fireplace, and putting down some protective sheeting or newspaper. Things will get pretty messy to start with. Firstly you should take a piece of sandpaper and give the whole fireplace a quick rub down. This will remove any lose mortar and dust that’s built up over the years. Wear a dust mask for this job. Vacuum over the bricks after sanding to remove as much of the dust as possible. You don’t need to get it sparkling, but it’s a good idea to give the brickwork a good scrub to get off as much soot and dirt as you can. A good primer/sealer paint should ensure the soot doesn’t show through, but it won’t hurt to reduce that risk even more by cleaning some of it off. Even if the fireplace isn’t stained with soot, bricks and mortar will collect a lot of dust and grime over the years so it’s still a good idea to wash it down. Whether it’s soot-stained or not, any bare brickwork will need priming before you paint it with the final colour. The 3-in-1 primer mentioned above is ideal for the job. Use a thick-nap roller to apply the paint more quickly. A thicker roller will help you out by getting into all the nooks and crannies. You may still need to go over the fireplace with a brush afterwards to get any spots that the roller missed. Allow the primer to dry. Once you’ve painted a coat of primer on, you’ll be able to see any holes or cracks much more easily. These can be filled with decorators caulk – see our Filling Cracks Project for help with this. Once the caulk has dried, go over the fireplace with another coat of primer. This second coat should go on much easier and be a much quicker job. The two coats will give a good base for your topcoat, and ensure that no soot or dirt comes through to cause stained patches. Make sure you let the second coat of primer dry completely, then get to work painting on the top coat of eggshell. You can use emulsion if you prefer, but it won’t be as easy to clean, and won’t last as long. As with the primer, use a thick-nap roller to paint on the eggshell, then go around with a brush and fill in any dips and crevices that the roller missed. By the time you’ve finished, the fireplace will look like a completely new feature – clean and unfussy, and if you use a nice contrasting colour you can create a real feature for the room.